General Fonseka, former Army Commander and Chief of Defence Staff has been arrested among others for alleged crimes against the State, including a conspiracy. While Fonseka supporters have so far not responded to the conspiracy charge in earnest except to dismiss it as political vendetta the public is interested in knowing more facts. Since the whole matter is still under investigation it would take some time for full facts relating to the conspiracy to emerge. Conspiracies are nothing new to Sri Lanka. Nor is the arrest of senior military officers strange or unprecedented. The Daily News wishes to publish several articles pertaining to conspiracies that happened or were alleged to have happened in the past. It would enlighten the readers on how governments act in case of alleged conspiracies by its citizens to overthrow legitimate governments. In Sri Lanka the accused have always been given a fair trial to prove their innocence and the ultimate decision has been taken not by politicians but the judiciary. Ms Udugama, wife of the former Army Commander, Major General Richard Udugama (fourth accused in the February Plot investigation) was one of the relatives of the twenty-eight accused men to visit the Flagstaff Street courthouse where the inquiry began. 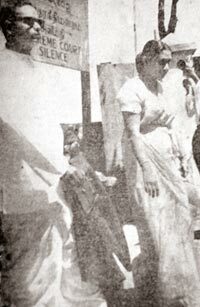 With Mrs Udugama is one of her husband’s counsel, Tissa Wijeyeratne. 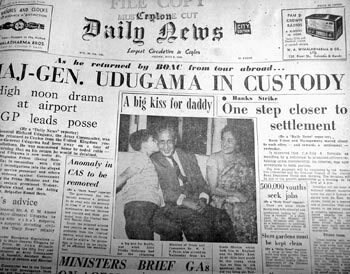 The Army Commander Maj Gen Richard Udugama was arrested at the Bandaranaike International Airport, Katunayake on his return from UK on July 7, 1966. He was on a tour of England to inspect military hardware for the Sri Lanka Army when the Defence Ministry summoned him home by a special coded message. But till he reached the BIA he was not aware that he would be arrested. The IGP John Attygalla with other Police officers were present at the airport when Udugama came down to the airport after disembarking from the BOAC flight. 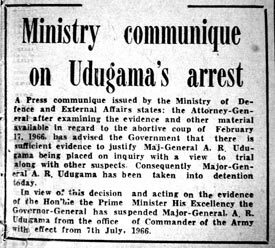 The detention order to arrest the Army Commander under Emergency Regulations in force at the time was handed over personally by the IGP. 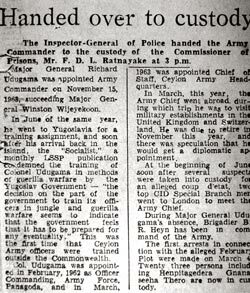 Richard Udugama was held after his arrest at the Magazine Prison, Welikada and along with others alleged to have been involved in a coup d’etat to overthrow the then UNP Government of Dudley Senanayake. He was produced in courts and remanded. Among the other suspects arrested were Captain Segara and an Army NCO Mayadunne. On July 14 that year the Attorney General A.C.M. 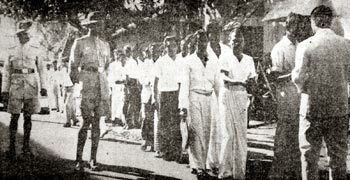 Ameer filed plaint before the Chief Magistrate, Colombo, B.G.S. David on two counts. 1) Having conspired to wage war against the Queen between December 1, 1965 and February 18,1966. 2) Having conspired between the said dates and in the course of the same transaction to overthrow the Government of Ceylon by means of criminal force or the show of criminal force. Army Commander Maj Gen Udugama was the fourth accused in the case while the eminent Buddhist monk Ven Henpitagedara Gnanaseeha Thera was the first accused in the case in which 28 were arraigned. On the day the case was taken up several VIPs including Dr N. M. Perera were present at the Magistrate Court. Among the counsel representing the accused were Prins Gunasekara, Anil Moonesinghe and Batty Weerakoon. Crowds queued up from an early hour for admission by gate-ticket to the courtroom.